In the cloud of commentary surrounding the last Super Bowl, actor Bill Murray said, “I like the way Seattle plays.” Sunday’s hydroplane race did not disappoint. My long-held wish to see human-powered vessels compete was at least slightly fulfilled by coverage of a ramshackle milk carton derby, originally inspired by local Weyerhaeuser's innovative cardboard packaging in the late Fifties. There was the obligatory unresolved finish of the big boats’ competition while the judges worked out some questions. I’d still love to see unlimited competition among the various classes of canoes. 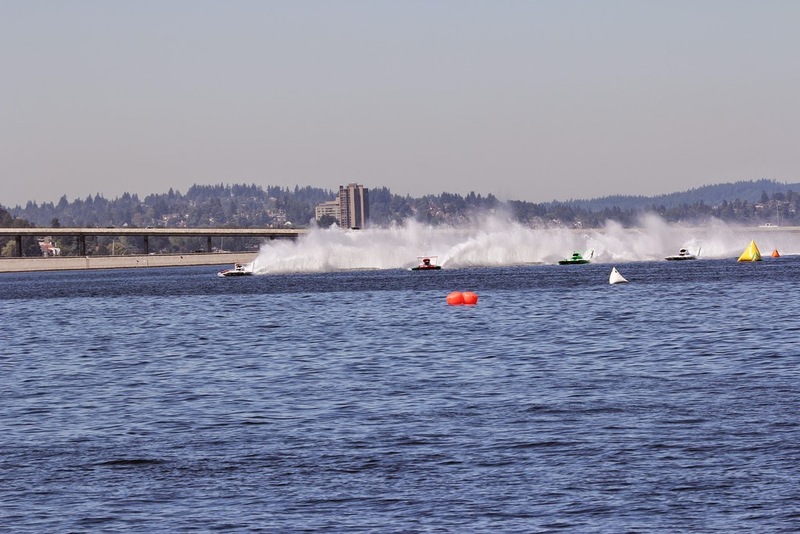 The F1 racing boats, that turn so fast, are new to me and fascinating. I can see wind-up bathtub toys raising money for the hydro museum. The boats’ movements are so unfamiliar they’d look like UFOs if they raced at night with lighted hulls. Someone tweeted Chip [Hanauer] for mayor. Apparently the broadcast of the race was available all over the world. Perhaps race day could be celebrated as a global Seattle reunion, like the 20,000 strong North Dakota picnic that used to take place in Lower Woodland during the Fifties.